For other uses, see Acetate (disambiguation).
. Chemists often represent acetate as OAc− or, less commonly, AcO−. Thus, HOAc is the symbol for acetic acid, NaOAc for sodium acetate, and EtOAc for ethyl acetate. The pseudoelement symbol "Ac" is also sometimes encountered in chemical formulas as indicating the entire acetate ion (CH3CO2−), or the acetyl group (CH3CO). It is not to be confused with the symbol of actinium, the first element of the actinide series; context guides disambiguation. For example, the formula for sodium acetate might be abbreviated as "NaAc", rather than "NaC2H3O2". Care should also be taken to avoid confusion with peracetic acid when using the OAc abbreviation; for clarity and to avoid errors when translated, HOAc should be avoided in literature mentioning both compounds. Although its systematic name is ethanoate (/ɪˈθænoʊ.eɪt/), the common acetate remains the preferred IUPAC name. Transition metals can be complexed by acetate. Examples of acetate complexes include chromium(II) acetate and basic zinc acetate. Commercially important acetate salts are aluminium acetate, used in dyeing, ammonium acetate, a precursor to acetamide, and potassium acetate, used as a diuretic. All three salts are colourless and highly soluble in water. Acetate esters have the general formula CH3CO2R, where R is an organyl group. The esters are the dominant forms of acetate in the marketplace. Unlike the acetate salts, acetate esters are often liquids, lipophilic, and sometimes volatile. They are popular because they have inoffensive, often sweet odors, they are inexpensive, and they are usually of low toxicity. Almost half of acetic acid production is consumed in the production of vinyl acetate, precursor to polyvinyl alcohol, which is a component of many paints. 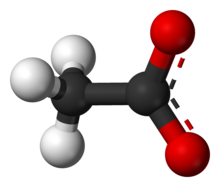 The second largest use of acetic acid is consumed in the production of cellulose acetate. In fact, "acetate" is jargon for cellulose acetate, which is used in the production of fibres or diverse products, e.g. the acetate discs used in audio record production. Cellulose acetate can be found in many household products. Many industrial solvents are acetates, including methyl acetate, ethyl acetate, isopropyl acetate, ethylhexyl acetate. Butyl acetate is a fragrance used in food products. Acetate is a common anion in biology. It is mainly utilized by organisms in the form of acetyl coenzyme A.
Intraperitoneal injection of sodium acetate (20 or 60 mg per kg body mass) was found to induce headache in sensitized rats, and it has been proposed that acetate resulting from oxidation of ethanol is a major factor in causing hangovers. Increased serum acetate levels lead to accumulation of adenosine in many tissues including the brain, and administration of the adenosine receptor antagonist caffeine to rats after ethanol was found to decrease nociceptive behavior. Pyruvate is converted into acetyl-coenzyme A (acetyl-CoA) by the enzyme pyruvate dehydrogenase. This acetyl-CoA is then converted into acetate in E. coli, whilst producing ATP by substrate-level phosphorylation. Acetate formation requires two enzymes: phosphate acetyltransferase and acetate kinase. ^ a b Zumdahl, S. S. “Chemistry” Heath, 1986: Lexington, MA. ISBN 0-669-04529-2. ^ Maxwell, Christina; et al. (2010). "Acetate Causes Alcohol Hangover Headache in Rats". PLoS ONE. 5 (12): e15963. Bibcode:2010PLoSO...515963M. doi:10.1371/journal.pone.0015963. PMC 3013144. PMID 21209842. ^ 'Is coffee the real cure for a hangover?' by Bob Holmes, New Scientist, Jan. 15 2011, p. 17. ^ Keseler, Ingrid M.; et al. (2011). 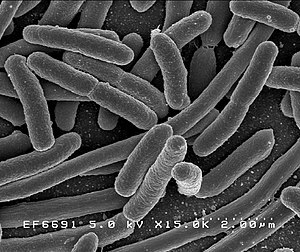 "EcoCyc: a comprehensive database of Escherichia coli biology". Nucleic Acids Research. 39: D583–D590. doi:10.1093/nar/gkq1143. PMC 3013716. PMID 21097882. ^ Ferry, J.G. (1992). "Methane from acetate". Journal of Bacteriology. 174 (17): 5489–5495. Retrieved 2011-11-05. ^ Vogels, G. D.; Keltjens, J. T.; Van Der Drift, C. (1988). "Biochemistry of methane production". In Zehnder A.J.B. (ed.). Biology of anaerobic microorganisms. New York: Wiley. pp. 707–770. Wikimedia Commons has media related to Acetates.